A weapon is more than the damage it deals. In combat, skilled warriors use their weapons to confuse, disorient, and disadvantage their enemies before moving in for the kill. Beyond Damage Dice ties unique maneuvers to weapons from both the core rules and the Midgard Campaign Setting, giving them a distinct impact on the battlefield. This article examines weapons crafted by vicious orcs using methods passed down throughout the ages. The orcish agrogash—literally, “wrath-pulling blade”—is more typically known as the “hook-bearded battleaxe” for the serrated hook at the bottom of the axe-head. This axe is typically the lightest and smallest weapon used by orcs, as they typically employ it while wielding a short sword in the other hand. First, the orc “hooks” its target with the long beard of its axe and draws it in, then skewers it with its off-hand blade. Tiger’s Jaws. If you hit a creature of your size or smaller with two melee weapon attacks while wielding an agrogash in both hands, you can make a DC 10 Strength check. On a success, you lift the creature by the hooks of your axes and throw it a number of feet equal to the result of the check. Scorpion’s Sting. As an action, make a melee weapon attack with your agrogash against a creature within 10 feet of you. On a hit, you draw the creature into your space. Your next melee attack against this creature this turn has advantage. Orcs believe in a philosophy of “bigger is better,” consequences be damned. 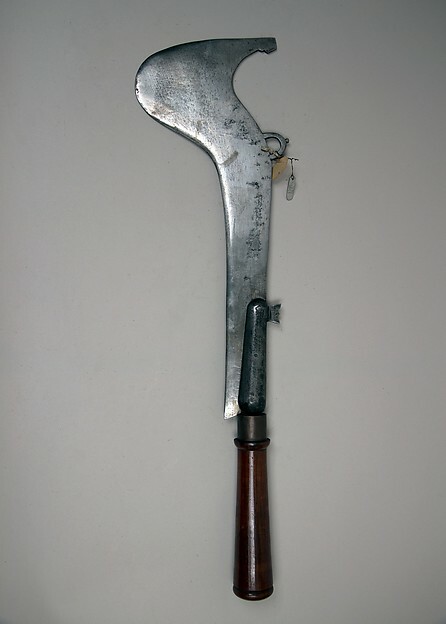 This philosophy is in full display in the mighty gorgash, which is literally translated to “blood-shower blade” in Common, though most simply call it the “double-axe.” This brutal weapon is little more than two battleaxes joined at the haft, its two double-edged axe heads are connected a six-foot-long haft. Because of their unusual size and balance, gorgash are typically used as dueling weapons, and are only taken onto the battlefield by the most theatrical or overconfident of warlords. Two-Headed Serpent. When you take the Attack action while wielding a gorgash, you may make one additional attack as a bonus action, using the “opposite” head of the axe. You do not add your Strength modifier to the damage of this attack unless you are have the Two Weapon Fighting fighting style. Charging Boar. If you move at least 20 feet straight toward a target, you can make a single attack with your gorgash as an action. If you hit, you deal damage as normal and the target must make a Strength saving throw or fall prone. Furious Hydra. As an action, make an attack roll with your gorgash against all adjacent creatures, resolving a single attack roll against each creature’s armor class individually. On a hit, roll 2d8 and add your Strength modifier and any other bonuses to damage you benefit from Divide the damage equally between all targets. The orcish bologorash—literally “flesh-rending flying blade”—is a wicked, serrated throwing axe attached to a 30-foot length of chain. Used most often as a pit fighting or gladiatorial weapon, orcs wield it to intimidate opponents just as often as they use it to actually kill. Orcish gladiators often enter the arena whirling their hand-axe-with-chain above their heads like a lasso to stir up the crowd. While holding a bologorash’s chain in one hand, you can retract the axe as your free Use an Object action each turn. Also, you cannot be disarmed while holding both the axe and the chain in separate hands. Buying and attaching a new length of chain costs 2 gp. Coiling Python. As an action, make a single ranged weapon attack with your bologorash against a Large or smaller target within range. On a hit, you deal normal damage and the creature must make a Strength saving throw, becoming grappled on a failed save. 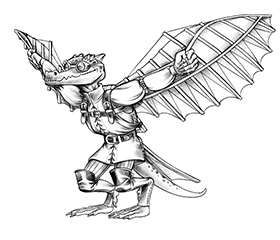 While grappled in this way, a creature can attempt a DC 17 Strength (Athletics) check to break the chains, ending the grapple and turning the bologorash into a normal hand axe. Screaming Vulture. As an action, you can whirl the bologorash above your head to cause it to make an eerie “howling” noise that can terrify nearby creatures. Each creature of your choice within 30 feet that can hear you must make a Wisdom saving throw, becoming frightened of you for 1 round on a failed save. Creatures with an Intelligence of 5 or lower have disadvantage on this saving throw, and creatures that can see you have advantage on this save. Hey Kobold Press love this product. Currently own and love Tomenof Beasts. Thank you for all the amazing work you do. I am the host of a podcast called Crit Academy. We were wondering if you would be willing to share a copy of this product for review on our show, and if your willing, maybe even have a member of your team join us on the show when we do discuss it. Thank you so much for the great work, been a fan since the Dragon/Dungeon Magazines. Keep being awesome! Keep your blades sharp and spells prepared heroes!